If you haven't followed all that was discussed, debated and analyzed at the World Economic Forum last week, here in a nasty, severely disturbing--and manna for paranoid conspiracy theorists--graph are all the issues our world economists and business leaders think could lead to economic/human/business/etc. crises in 2010. It is so interactive that it lets you see the likelihood of the severity of the threat, how it affects all the other factors and how much the loss can amount to in US dollars. You can even choose by domain and see how the others relate, the domains being Technology, Economics, Geopolitics, Environment and Society. 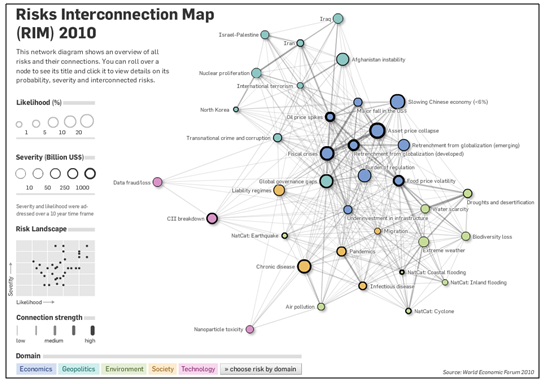 While you get a sense of how much of graphically visual delight the map is above, you can access it in its entire interactivity on the World Economic Forum website and play around with it and see what might kill us first! It is cause for alarm? The fact that the map addresses the likelihood of the threat over 10 years might help placate some of us. For the rest of us, these should be used as indicators of what needs to be addressed in our day-to-day life, whether as consumers, business decision-makers, sustainability strategists or employees and to push the message out to the society and up within your organization.